The Idea Cellular might not be that famous in the line of smartphones but it is certainly among the #2 as an network operator. The idea expanded its smart phone product line by launching ID 280 and ID 918 smartphones all priced below Rs.9,000. It further wants to expand its products line by launching Aurus smartphone which will soon available in the market. It includes 3.5 inches capacitive touchscreen display and specifications of the device suggest that it would be an entry level smartphone with just enough features. One of the great thing about this smart phone is that it would be powered with Google’s open source Android Operating System which is like forest with varieties of apps and features, among the biggest features includes the Wi Fi internet access, Wi Fi tether and few more. Among the best thing of Android OS includes the pre-loaded Google Apps like Google Mail, Google Maps, Google Drive, Google +, Google Talk, Google Navigation, Google Calendar, YouTube and Google Play Store. The users can download the thousands of Android application to their mobile phone via the Google Play Store. These apps are nothing but different tools, widgets, software, games, educational content submitted in the form of app and this has been the biggest advantage of the Android OS on mobile phones. The Android version included in the smart phone is Android 2.3.6 Gingerbread and it will not be updated to Ice Cream Sandwich or higher. Its screen provides 320 x 480 pixels resolution certainly not the best. It has dual SIM capabilities provides users to make use of Voice plans of one telecom operator and data usage of other. It is powered with 800 MHz single core processor, just enough to power operating on the phone at fair speed. It provides 256 MB RAM support. The other good thing in Idea Aurus is its camera with 5 mega pixel providing video recording and image capture facilities. It is possible to record 720p HD Videos easily with Aurus smartphone camera and VGA front facing camera can be used with Google Hangouts for face to face video chat. This devices includes 4 GB of internal storage capacity and just like all other smartphones this too has micro SD card support for further storage options. It also includes the other options such as Bluetooth, GPS, EDGE and 3G internet access along with Wi Fi internet connectivity as well. 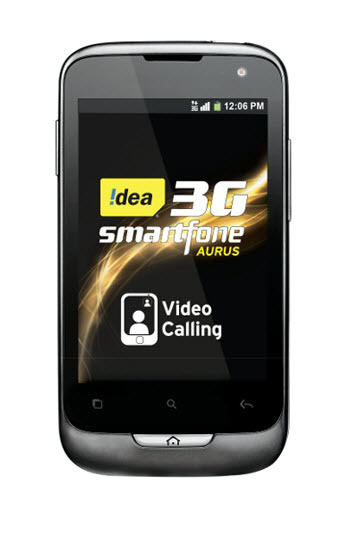 It provides interesting promotional offers and benefits to anyone who chooses Idea Aurus smartphones. Any one choose pre-paid subscription they will be provided with 10 minutes of free calls every day for 3 months by recharging with Rs 259 or Rs 269. Also they will get 2 GB of data and IdeaTV service subscription for 90 days. For post paid consumers, 2 GB of data will be free for three months with a plan of Rs 260 and they also get Rs 100 waiver on voice calls per month with free Idea TV subscriptions for three months. It is available in selected Idea Stores, special promo at Aditya Birla Malls and leading retailers as well.